Hedgehog is for anyone who wants to explore robotics, no matter their age or expertise. It is particularly suited for learning programming, but doesn’t stop there: building your own robot allows you to explore mechanics as well, and experienced programmers can tackle complex projects, such as swarm intelligence, advanced image processing, or developing their own microcontroller firmware. Hedgehog is developed by the Practical Robotics Institute Austria and is a robot controller: the control module and heart of any robot. It can be combined with standard RC servos, DC motors, as well as various kinds of sensors and push buttons. Its case connects easily to Lego building blocks, but of course robots can be constructed from any kind of pieces. In many ways, Hedgehog is similar to other controllers, but what makes it stand out is its versatility. Hedgehog supports both visual and textual programming through Blockly and Python. It allows you to connect different kinds of custom hardware through its UART, I2C and SPI busses. You can connect to Hedgehog over Ethernet, WiFi, or by directly plugging in monitor and keyboard. Use either the beginner-friendly in-browser development environment, or use SSH to access Hedgehog’s Raspberry Pi directly. Augment your controller by using thousands of third-party applications & libraries for the Raspberry Pi. Get into Digital Manufacturing by downloading our blueprints and laser-cutting a customized acrylic case – the possibilities are endless. “We use Hedgehog in workshops all the time, and simplicity and versatility are two major requirements for us. Simplicity allows our learners to focus on exploring robotics, instead of handling the system. 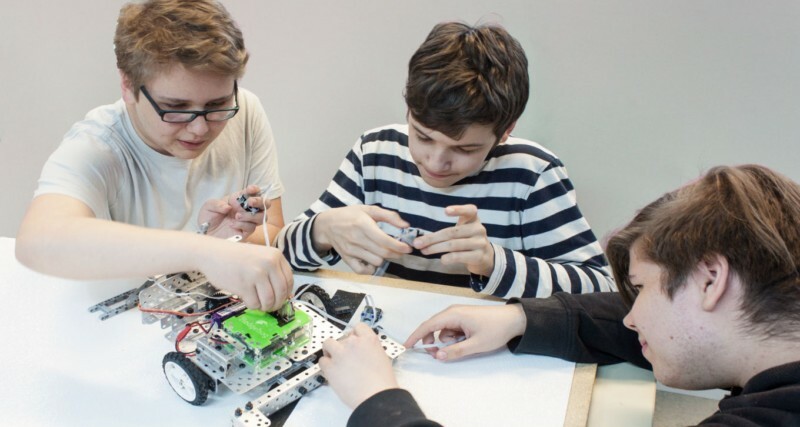 And versatility allows us to work with the same hardware in different settings, be it with elementary schoolers, in robot competitions, or in projects with students from technical high schools,” says Clemens Koza, one of Hedgehog’s developers. Workshop and classroom settings are indeed a focus of the controller’s design, but hobbyists profit from this as well: more possibilities potentially mean more projects and experiments, making the controller a cost-effective purchase. All of Hedgehog’s hardware and software is open source, Clemens Koza explains: “when versatility is one of your goals, hiding details is counterproductive. We’re convinced of our system’s value and dedicated to its ongoing development. We try to enable a broad audience to explore technology and engineering, and I think Hedgehog is a great tool for this.” Hedgehog is currently on Kickstarter, and more information is available at hedgehog.pria.at. Dieser Eintrag wurde veröffentlicht in Crowdfunding, General, Hardware und verschlagwortet mit Hedgehog, Kickstarter, robotics controller von Sebastian Trella. Permanenter Link zum Eintrag.